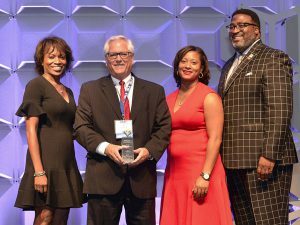 The Airport Minority Advisory Council (AMAC) recognized Jon E. Mathiasen, AAE, president and CEO of the Capital Region Airport Commission, with a Hall of Fame award at the Catalyst Awards luncheon at its 34th Annual Airport Business Diversity Conference in Seattle on Friday, August 24, 2018. “I am honored and truly humbled to receive this recognition. Diversity awareness and inclusion in contracting opportunities for capital projects, goods and services, and concessions have been high-priority objectives at Richmond International Airport (RIC) for many years,” said Mathiasen. The Airport Minority Advisory Council’s mission is to promote the inclusion of minorities and women in contracting opportunities and professional development throughout the aviation and aerospace industry. Since 1984, AMAC has been at the forefront of nearly every national policy initiative impacting the participation of disadvantaged businesses in airport contracting. AMAC works consistently with congress, the federal government, aviation trade associations and others as a resource for information, education, and guidance on business and employment matters. For more information, please visit www.amac-org.com. Richmond International Airport is one of the most modern and efficient airports in the eastern United States. Scheduled service from RIC offers nonstop flights to major domestic destinations and connecting options to points around the globe. In FY2018, RIC welcomed more than 3.8 million passengers. For more information, please visit flyrichmond.com.